| Dive the B29 with TDL! THE B-29 Bomber and Guided Dives are Not Available for 2018. NPS is taking a break this year. We will look at diving it again in 2019. In the meantime take a look at our site and learn about this great underwater relic. Welcome to Dive the B29. 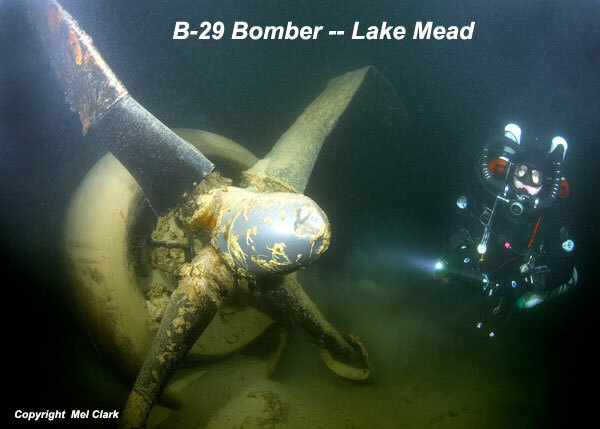 The B-29 Bomber is a Super-fortress plane that crashed in Lake Mead. Scuba Training and Technology Inc. / Tech Diving Limited has the Commercial Use Authorization from the National Park Service to conduct guided tours for 2015 and 2016 on this historically significant site. The B-29 Bomber is located in the Lake Mead National Park just outside of Las Vegas Nevada. We conduct guided tours on the site every month through October for qualified divers. All the information about how to qualify and how to reserve your space is on this website.